Our family has loved, raised and trained Labs since 1994, with kids and lots of noise!!! The pups are raised in our house literally under our feet. They are raised in our home as part of our family from birth until they are ready to go to their new families. They are socialized with kids and other dogs. Our house is a petting zoo most of the time. All of our family and friends bring their kids over when the puppies are old enough to have visitors. We call their visits a “puppy fix” or “Puppy Therapy”. There isn’t a better remedy to take your problems away than sitting in the middle of a bunch of happy tail wagging sweet kissing puppies!!!! My days are always good when there are puppies around. That type of exposure to new people, new smells and new activities is very important to help these little ones mentally develop their social skills. We start working with the pups long before they can have outside visitors. We imprint on them as soon as they are born. We are there during the delivery, we help them they take their first breath — Tamra is the “midwife” for the moms and their pups. It takes 12-18 hours on average to deliver a litter of pups depending on the size of the litter. Most pups are born an hour or two apart. If you add up all the countless hours of hard work that’s put into every detail of raising puppies the good quality dedicated breeders do not even make minimum wage. 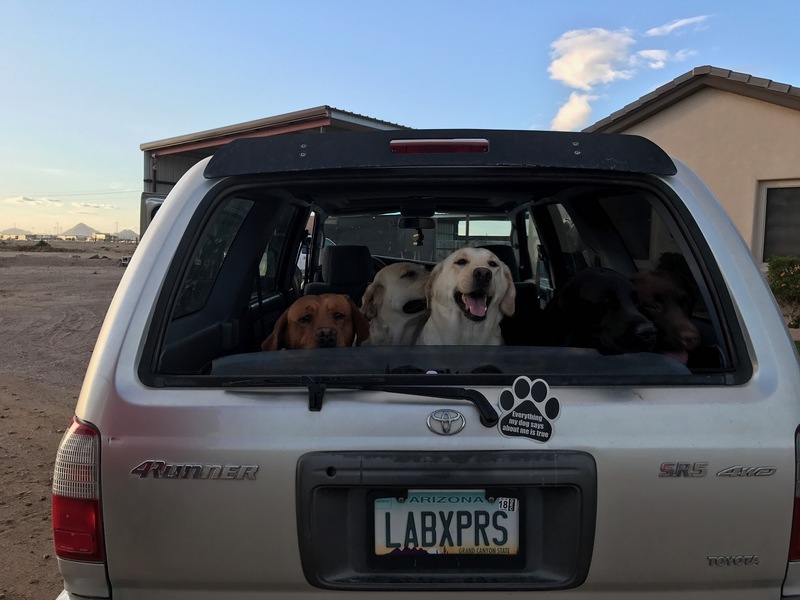 Many of us go into the negative each year producing these quality Labs, we don’t do it for the money or we would take all the short cuts that the regular Lab breeders do. You need to make a profit to be recognized as a business, we have been deemed a hobby breeder. Not everyone can understand or appreciate the value and extras that good quality breeders provide for their pups and their mommy until they have had a bad experience from getting a bargain puppy from a breeder who didn’t know or didn’t care to do it the right way. We learned this lesson the hard way in the late 1980’s. In the world of dogs, you really do get what you pay for and we have our own horror story to share — this is what drives us to do it the right way and to go the extra mile so none of our pups’ families will ever have to go through what we did so long ago. We didn’t have any experience or knowledge when we were young adults in the 80’s and the difference in fees of what a puppy cost didn’t make sense to us. We shopped for the cheapest puppy out there and went to a bargain breeder to get a Golden Retriever puppy. We should have run out of there and called the authorities, it was really bad. Although all our red-flags were flying high we made a huge mistake and didn’t listen to our gut feelings. The puppy was being raised with a sad mommy in a very small dirty environment. The puppy was sick but we didn’t know that until we got home and ended up taking her to the vet almost immedately. When he told us how bad it was we were shocked. Even if this breeder would have had a warranty on the health of this puppy there was no way we would have taken her back to that terrible place (baragin breeders never offer warranties on a bargain puppy), but breeders like that take your money and change their numbers after you walk out the door or never return your calls if they do keep the same number. It was much worse than her just being covered in ticks and a case of worms. That would have been something that she could have recovered from. We knew better when we got there and saw the conditions they were in but our hearts were breaking for the poor puppy who had never see the inside of a house, starving for attention and underweight from improper diet and severe parasites. We had to save her from her horrific conditions — we spent enough at the vet trying to fix her and save her we could have paid for several really well bred pups!! In the end the problems all of the ticks created to her poor weak body as a puppy were not recoverable and that ultimately caused her to die at a young age, barely 2 years old. The worst part of this story is what we put our young kids through as they watched their poor puppy struggling to be a normal happy pup, and it just never happened. This is an extreme case and, thanks to major changes in our laws since the 90’s, won’t happen again. Our Sheriff shuts those kinds of puppy mill bargain breeders down as quick as they start up. But some of these things can still be a concern from the bargain breeders so do your homework and get referrals, buyer beware if your getting a bargain — it may cost you a lot more in the long run, and too much heart ache. There is a major difference in the way some mommies and pups are raised and taken care of, please don’t learn the hard way like we did. Quality breeders provide lots of value and extras for their pups to get them started out the right way. We really appreciate those who do recognize that what we do is important, and cater to those who understand there is a reason that quality pups are worth every dollar of the fees and more. From the time they are born we start working with them on sensitivity training. We do all kinds of different types of activities with them to get them accustom to having their ears, mouth & teeth, feet & nails, and bellies rubbed so they can become the “floppy dog” like their relatives. We teach them to enjoy being upside down for “Rock-a-bye Baby” which they hate at first but with lots of love and patience they learn to trust that they won’t be dropped and come to enjoy it. We also mess with their rear ends and tails when they are eating to help desensitize them to interruptions in the future from kids and other pets. We do not want food possession to be an issue. They are doggy-door/potty trained by the time they leave our house which makes it much easier to potty train them for your house. They are even introduced to a crate before they go to their new homes. We put 24/7 into these pups, they are never left alone. If we do need to leave for the day or over night we have puppy sitters come and watch them for us. We take this very seriously and believe that all that we pour into our puppies is what gives them the best start to becoming the best Labs around. There are many sleepless nights around here but it’s very important that a pups every need is met, and the sacrifices we make are worth it when we get updates from families that say, “this is the best dog they’ve ever had”. There are different types of Labradors, English style and American Field style. They look different, act different, and they attract a different type of family that wants them. We’ve had both types but the Labs we like best as pets and service dogs are the English type — they have sweeter personalities, calmer temperaments and a different appearance with blockier stockier thicker bodies, heavier boned, block heads, wider chests and fat otter tails. The English type tend to be the most popular for the majority of the families looking to add a new Lab pup to their home. The American Field Labs have too much energy for us, but they are great for avid hunters. Ours will also hunt, and many of our families use them to retrieve their birds, but our Labs are best suited for the casual occasional weekend here and there type of hunter. English Labs are the calmer mellower type that make for the best Labs to live in the house with a family and want to be active outside doing fun activities too. We like to say they have an on and off switch. We are a small hobby breeder in north Phoenix, Arizona. We are located between Anthem and Cave Creek. We are not a business. Our passion is to produce puppies that have a purpose. That purpose may be to be a loving companion, a fur kid as we call them. We have bred many therapy dogs, assistance dogs, and service dogs for several families with special needs and many show dogs that we keep for ourselves. The majority of our puppies will be available to homes that are looking for a new four legged family member with the job of just being a good dog! Our pups are most happy as house pets and need to live inside the house with their people. Labs are a co-dependent breed and do not do well living in the back yard by themselves or just with another dog. They do not do well with super busy families that work all day and are gone all weekend with activities and obligations that don’t include them. We will talk you out of getting a Lab if it’s in the best interest for the dog and the family. We want to set everyone up for success — if you don’t put the time that’s required into the dog, you will have destruction and mayhem from an unhappy dog. We are constantly interacting with our fur kids, they are all considered house pets. Our adult dogs are AKC/OFA/CERF Certified Hips, elbows and eyes clear and free of genetic diseases. We breed to our top studs, or top studs around the country that are AKC/OFA/CERF/DNA/PRA CLEAR. Our puppies are the English stocky/blocky type of Labrador, bred from champion pedigrees. All of our pups go home with a 24 month hip warranty. All of our pups are vaccinated, wormed, micro chipped, have dew-claws removed, and are fully vet checked. We have one slight difference from some of the other English Labradors that are sometimes seen with other breeders: we like them to have normal leg length. We don’t care for the look of the really short legs that we’ve seen on some English Labs out there at other kennels. They are starting to look like Basset Hounds, Corgis and Dachshunds, which are all great breeds (please don’t misunderstand the reference, we love them all), but those breeds are supposed to be long bodied with short legs and they look really cute with their little stubby legs and long bodies. We just don’t want our Labs to look like they have stubby legs. Our boys have normal leg length and that’s what we look for when we use a stud from other kennels. Our labradors must be in proportion, their back length needs to equal to their leg length. We do have some females that are more compact but still in proportion that are super cute. We stay within AKC guidelines and standards — not too big (no super sizing going on here) and not too small (no minis produced either, although that would make some people really happy). We really just want to produce Sweet, Smart, Healthy, Gorgeous Labs. We are always striving for that “perfect Lab” that can do it all and look great doing it. Most important, our dogs are well mannered and beloved family members, real couch potatoes. Our adult Labs are active in hunting, showing, dock diving and more. Our pups come from lines with “do it all” pedigrees. They are bred to be great companions and family members first, but are also capable of working as therapy or assistance dogs, performing in the field retrieving birds, competing in agility trials ~ Dock Diving ~ Disk Dogs or entering the dog shows in the obedience ring, the possibilities are endless for our puppies! We send each puppy home with a gift basket that includes a folder with your puppy’s certifications, registrations, a vaccination record booklet and other helpful information to help you raise your new puppy. We also send each puppy home with a small bag of the same food the pups have been eating since they were old enough to eat solid food. All of our Labs enjoy eating premium quality dog food, especially the puppies when they are weaned. We prefer to purchase our dog food at The Pet Club because they have the best prices, great customer service, and they are knowledgeable about their products. Check out The Pet Club’swebsite for locations and services. The adoption fees for our pups are the same for all our pups, it doesn’t matter the gender or color. We have a spay and neuter agreement, we do not want our pups grow up and be improperly bred even if it’s accidentally. After all these years of blood, sweat and tears creating the best Lab possible, it could all be undone with one mismatched or bad breeding from someone who doesn’t understand the genetics. We do not want to contribute to the failing of the breed so it’s best to require this be done at the appropriate age. We expect the best for our pups and you can expect the best from us. We will be here for you long after you take your new baby home! We encourage you to checkout our references. If we sound like the right family to get your new Lab puppy from, please call us for any additional info or to plan a visit to meet the 4 generations of Labs we have here that we call our kids.